Not only does Oregon have the Columbia River Gorge but it also holds little treasures like Punchbowl Falls. To get to this epic waterfall you have to endure a 3.8 mile round trip hike but good news it's difficultly level is easy. This hike is recommended for children ages 10 and up and is available to hike year round. 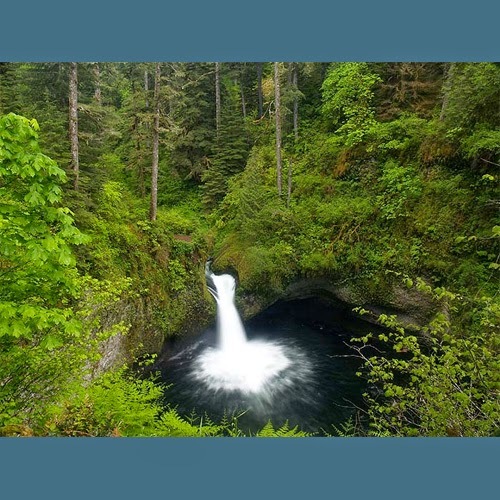 If you start from the Eagle Creek trailhead you get the 3.8 mile experience, start anywhere else and this hike can take as long as 13 miles to get to Punchbowl Falls. Read more about the hike from Eagle Creek to Punchbowl Falls below. After you've walked about a mile and a half, watch for an obvious spur trail off to your right. The path drops down to an overlook with a view of the magnificent 100-foot Metlako Falls, which seemingly shoots straight out of a cliffside into a large pool below. Walk back up the spur trail to the main drag and continue southward, winding high away from the gorge with the creek well out of view. In just over a half-mile you'll be at an obvious, signed junction and resting spot near your destination, Punchbowl Falls.